Foldaway hood in collar, zip and press stud closure, two inset pockets, high frequency welded seams. Back length 85cm. 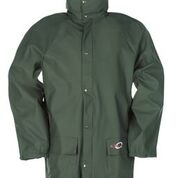 Flexothane is waterproof and windproof, noiseless, 150% stretchable, supple, highly tear resistant and machine washable.